The Government of Alberta acts on organic legislation that will significantly benefit organic businesses in Alberta and improve consumer confidence. EDMONTON, AB, June 1, 2018 – This week, the Government of Alberta passed Bill 7, the Supporting Alberta’s Local Food Sector Act which will at long last regulate organic products that are grown and sold within the province of Alberta. 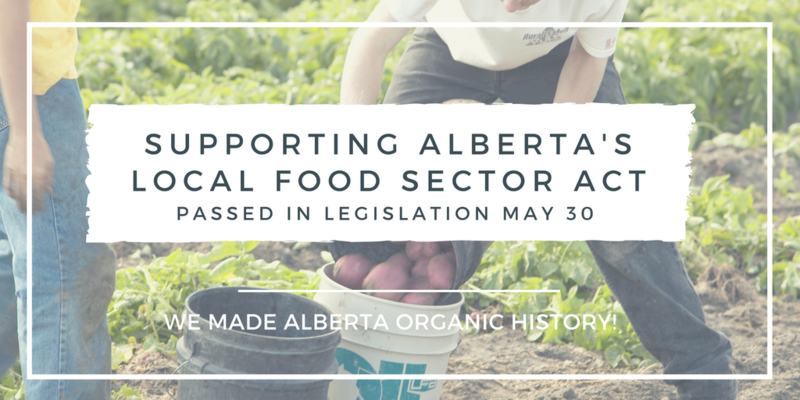 Organic Alberta members have been actively lobbying this and past governments to adopt the organic legislation since the federal organic regulation passed in 2009. This means that everyone who uses the term “organic” to sell products in Alberta must now be certified to the federal organic standard. Most importantly it means that Albertan consumers can have complete confidence in the word organic, as it will always mean certified and third party inspected to ensure that the products have been raised, grown, and processed according to the rigorous Canadian Organic Standards. Farmers who have been following organic practices and would like to market their products as organic in 2019 are encouraged to apply with a certification body as soon as possible. An application must be submitted to a certification body 12 months prior to harvest, and 15 months prior to marketing an organic crop. Organic Alberta has various programs to support farmers through the transition period, including the Pivot and Grow website, and Transition Starter Kits. We also encourage anyone wishing to become organic to contact us directly.